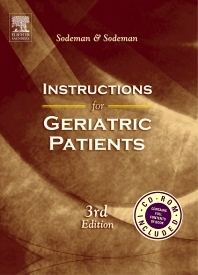 The resource American Family Physician called "a valuable and convenient source of educational guides"
in outpatient geriatric care are covered by 185 information sheets. Each sheet features an overview of the problem, important points of treatment, directions on when to contact a physician, and space for customized instructions. Plus, a bonus CD-ROM offers the instruction sheets in a handy electronic format! Improves compliance, calms concerns, and strengthens the doctor-patient relationship. Examines clinical conditions such as depression, heart failure, stroke, pneumonia, anemia as well as issues such as incontinence, falls, nutrition and diets, driving, end-of-life care, living wills, and much more. Addresses issues specific to caregivers and anticipates difficulties they encounter. Features perforated pages for ease of photocopying as well as customizable PDF versions of all 185 sheets on the bonus CD-ROM. Allows readers to add their own instructions with additional space provided on each printed topic sheet. Makes information easy to grasp with a large type size and a consistent, patient-friendly format.